Day 10 was spent immersed in my passion for military history at one of the world’s most historic sites: Pearl Harbor. After arriving the night before, I set out for Pearl Harbor by public bus. The public buses on Oahu are wonderful. The Hawaiian bus drivers are incredibly nice and helpful. Just tell them where you need to go and they are full of suggestions and will often call out to you to make a transfer. I have been taking buses all day and found everyone of the drivers to be hugely helpful and kind. Trips cost only $2.50 and you get to see more of the island (including areas with large numbers of homeless people). After visiting the Pearl Harbor museum (which has an actual Japanese Type 91 that was found and detonated). It is still largely piece. It was a remarkably accomplishment for the Japanese, who added wood attachments on the tail fins that would come off after hitting the water. The U.S. assumed that Pearl Harbor was to shallow for an attack. The Japanese proved us wrong. (We would continue to use the Mark 14 torpedo for two years before it was truly functional). I then took a boat over to the USS Arizona memorial. which is continuing to leak oil after all of these years. The ship is still visible from its gun turret above the water and deck just below. The memorial is quite moving. Nearby is the USS Missouri where the war came to an end with the signing of the surrender by the Japanese on its deck. So the two ships lay next to each other. One symbolizing the start of the war for Americans and the other symbolizing its end. Truman visited the Missouri repeatedly (Margaret Truman christened the ship). Many (correctly) felt that the war should end on one of the ships that was present at Pearl Harbor but Truman insisted that the ship named after his state would be given the honor. He was wrong in my view. I agree with the many in the Navy who wanted to have the Japanese come to the deck of one of the ships from Pearl. Nevertheless, it was a thrill to stand where the surrender was signed. The most poignant moment came when Douglas MacArthur had As witnesses, American general Jonathan Wainwright, who had surrendered the Philippines, and and British general Arthur Percival, who surrendered Singapore, as his witnesses. Both men had only recently been released from cruel Japanese prison camps (Wainwright was released only a week earlier) and both men weighed no more than 100 pounds. It was a thrill to stand in that very spot. (The surrender may have saved my father’s life since he was due to be in the leading assaults of the Korean invasion as part of the crew of a Landing Ship Tanks (LST)). Near the spot is a slight dent in the superstructure of the Missouri where a kamikaze hit the ship during the Battle of Okinawa. (The Japanese pilot was later found and given a proper military funeral the next day). It was an amazing time on the “Big Mo” which saw service into the 1990s (including the Gulf War). After exploring Pearl Harbor, I took the bus to near Diamondhead to watch the sunset. I found an incredible spot near the lighthouse where surfers were riding waves. I made it back via the public bus to the hotel after a glorious day that began at Pearl Harbor and ended with the sunset over Diamondhead. If I have a hero, it’s a Marine. 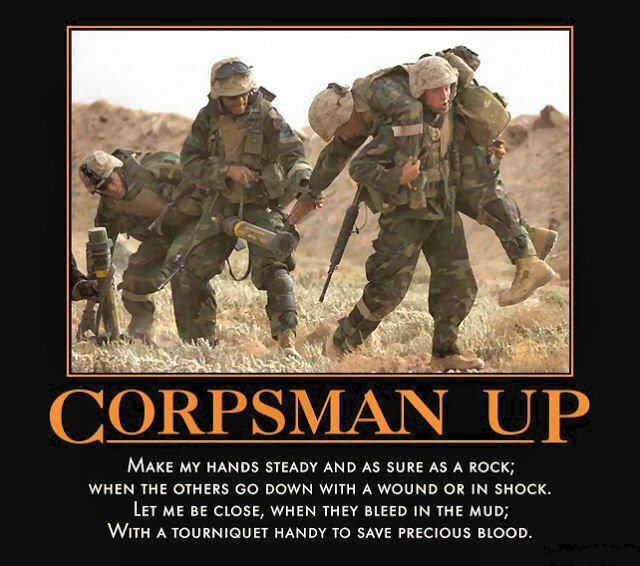 If a Marine has a hero, it’s a Corpsman. I forgot to mention. That’s a nice composition shot with the flag at the top. Yes, it was nice, with the flag flying over the Arizona memorial. Professor, if you are still on Oahu, try to visit the submarine chapel. Ask about the bells. Ask about innocent passage. Maybe I’m wrong. Maybe Paul is right. I could do worse in life than being proven wrong by Paul Schulte. Just promise, Paul, you would at least think about sending a heaving line my way if my ship was afire. What would most think of as freezing cold. I am hardly a viking. Which makes you a Navy Corpsmen, and God knows the happiest sound I could hear in extremis are the blades of H-60, or just a friend. Or maybe a Gurka which could translate as friend I suppose. Ayo gurkhali? I have your knife. You can come and get it any time. Steve57 – that’s a Navy Corpseman according to Obama. And he went to Harvard. Maybe Olly can remember. I recall something along the lines of the CINCPACFLT INCSEA (Incidents at Sea) CONOPS. And when we depart from them. Rules we were supposed to operate by when foreign forces hazard our vessels. And then throw into the wind if they wanted to know what ugly looked like for reals. If you haven’t left Hawaii yet mention the word “salvage” to your hosts. As it must be for all Americans. I disagree with you on many things. But not love of country. These men weren’t weak, afraid, they weren’t incompetent. They had survived the depression and were the last critters anyone should have thought about attacking. They were poorly led. Not at the deckplate level, not even from the bridge, but from higher. One of my favorite metophors for life is how Don Stratton escaped the burning, exploding Arizona. He was in one of the gunfire directors. The Arizona was moored alongside the USS Vestal, a repair ship (Arizona was due for upkeep). During a lull in the attack when the smoke cleared they could signal the Vestal to throw them a rope. To their good luck they signaled Joe George, a boxer, maybe the strongest man in the Pacific Fleet, and at the time under restriction for brawling. They signaled someone who didn’t give a f***. The skipper of Vestal had ordered his Sailors to to cut all lines to the burning, exploding Arizona. George was in the process of doing so when he saw Stratton and his gun director crew, and stopped and threw them a line using a monkey ball. The skipper had a problem with George throwing lines to the very ship he had ordered all lines be cut, confronted George, and George told his skipper to go to h#ll. He was never court martialed, but neither was he recognized. All the men in that gun director, including Stratton, made it from the Arizona to the Vestal. But what struck me was how Stratton described crossing that rope over flaming sea of oil. The line sagged. And with most of the skin burned off their palms they made it fairly easily to the midpoint, downhill, but the rest of the way was sheer agony. Such is life. It’s easy to make it halfway. My bad. It was passed down to me as Monkey ball. Apparently the proper term is Monkey’s fist. How in the name of holy f*** do you come to that conclusion? International maritime law states, and stated then, that innocent passage through another nation’s territorial waters required a submarine to transit on the surface flying its flag. Steve57 – would you cite that maritime law as written in 1941? And remember, the Japanese were not signatures of the Geneva Convention. Unfortunately I am relying on Wikipedia at the moment. I can give this more attention later in the day if you like. but international law has, since the advent of submarines, required them to transit on the surface in order to claim innocent transit. Steve57 – if I remember correctly, it was the USS Ward, commanded by a reserve officer who spotted the periscope and depth charged it. It was only in the last couple of years that they actually found it. When the Ward reported its action, the brass at Pearl thought they were over reacting because he was reserve. As a special note. Do not depend on Wikipedia. They are right about 50% of the time. As I said, the Japanese were not signators of the Geneva Convention. I do not normally rely on Wikipedia. That’s why I mentioned it, to bring it to your attention, and also my trepidation. The Ward’s report of it’s ASW action didn’t get to Admiral Kimmel due to pure bureaucratic constipation. It had nothing to do with reserve v. active duty. You’d think in the past 75 years we would have fixed this but to my horror we have not. Maybe the difference between transit and innocent passage is too subtle Dunno. I can keep digging if you like, but there was no straight that the Japanese submarines could have invented that would have allowed them to operate submerged off the mouth of the entrance to Pearl Harbor. I remain your servant and will, if you wish, dig deeper. Steve57 – I appreciate the effort, but there is no cite to any authority. Because international law is a heap of fermenting compost. It is comprised of a mess of treaties and customs. It’s why German Grand Admiral Karl Donitz only served ten years. He was charged with ordering unrestricted submarine warfare, then deemed a war crime under various treaties and the customs of war. 19th century prize rules. But then Fleet Admiral Chester Nimitz threw a wrench into the Nuremberg trial works (our Germans were better than their Germans, our Italians were better than their Italians [if you drive on the I-5 between LA and Sandy Eggo, you best bow your head when you see the exit sign for Basilone Road]). Nimitz had ordered the same thing after Pearl Harbor. Boom! Unrestricted submarine warfare, attacking submerged without surfacing to show the flag, was from then on an accepted practice. If a submarine wants to claim the right of innocent passage it does so on the surface, flying its flag. Sorry if I can’t show a specific document that says so. If it enters a nation’s territorial waters submerged, and is discovered, that is considered a hostile act. The sub can be hunted down and killed. Even by Sweden. I’ve looked for the treaty, the document, whatever, and I can’t find a specific one that defines in no uncertain terms what you want to hear. But the centuries of treaties, customs, and practices that comprise international maritime law does state that if you want to claim the rights and protections of innocent passage through another country’s territorial waters you do so on the surface, flying the flag, conducting no operations such as flight operations that could be perceived as hostile. If you would like a more authoritative source, see Sweden’s wake-homing torpedoes. Steve57 – Again, I appreciate your efforts, but if you cannot dot the is and cross the ts, you are just blowing smoke up my skirt. Paul, I’m going to have to give you this one because I promised to keep a secret, and I keep my promises. All that I am left with is the weak proclamation that men-o-war fly their flag if they wish to claim innocent passage. I don’t know where to find any document that states this. Feel free to found a nation, build a navy, and do it differently. Steve57 – if I am reading you right, the only source you have to lay a claim to is secret. BTW, men-of-war have not gone to sea since the 19th century. So, much as I enjoy and appreciate your arguments on Islam, I am not holding out any hope on this one. Paul, I respect you a great deal. Since I can’t prove otherwise, and I don’t really want to anyway, I concede to you that United States ships are not bound by any existing norms customarily called the laws of war. Thank you for your interest in national defense. You win. I salute you sir. The difficulty is that when it comes to the law of warfare, not all the “i”s have been dotted and all the “t”s crossed. Even to this day. George Washington insisted the American army would fight in accordance with the rules of war that later became the Hapsburg and Geneva Conventions. In order to establish itself as legitimate army as opposed to the British who were imprisoning Americans in horrid conditions. Will this make a dent? I doubt it. Steve57 – actually no. Washington only had control over part of the army. The other part were part-time volunteers. Some would not even leave their state. I do admire what Washington did with his army especially after von Steuben cleaned them up. SOunds like you had a great trip! I honeymooned there years ago. Diamond head is nice. Loved the Denny’s near St Augustine church…grand slam prices right off the beach! ( well Hawaii’s version was more than 1.99, but still a great deal). Punchbowl Crater, with its intricate murals showing major battles of the Pacific was great too…after walking thru and reading them I felt I had learned a few things. I will read about the rest of your Pacific adventures this weekend. Thanks for sharing! They had to modify the torpedo to make it work in Pearl Harbor. There were also 5 mini-subs. 4 have been found. One was sunk before the Japanese attacked, making the US the aggressors. Two probably got torpedoes off against major ships. The last beached and the occupants became our first POWs. Have fun. Trump is rolling back the regs on clean air and water as fast as I can type. Who hates clean air and water? Or like pollution is “fake news” made up by CNN. Get your gas masks. Omigosh are we going to have the killing dirty are that we were only saved from by the last few months of Obama’s EPA? Blow me, anon, you and the horse you rode in on. I would rather view the way people live than the way they were killed. I would rather view both, and be outside Plato’s cave then inside looking at the shadows. This is how you walk into an ambush. I would rather be homeless in Hawaii than homeless in Chicago.